Perfumer Vedat Ozan says that it is difficult to define a city with a single fragrance. Poet Orhan Veli Kanık writes: "I'm listening to Istanbul, intent, my eyes closed." He drew the portrait of this archaic city's soul with the sounds he heard. Many musicians play their instruments with their eyes closed to enter the invisible world of sounds, avoiding the effects of other senses. What about our sense of smell, the world of fragrances in which we find ourselves whenever we breathe? Here we have a specialist who examines and researches the world of fragrances, from history to sociology, from the world of perfumes to fragrance psychology, and writes books and gives lectures at universities: perfumer and fragrance expert Vedat Ozan. He has published three volumes of books on the history, culture and sociology of fragrance. In the cultural studies master program of a private university, he lectures on the "Cultural History of Smell and Senses." He conducts fragrance workshops and gives conferences at home and abroad. He actually studied economics at Boğaziçi University. He has also worked in the import and export business for many years. Although he is self-taught on the subject, Ozan is one of the world's leading fragrance experts today due to his effort, studies and readings. He also provides training for this job. Ozan sees all aspects of the sense of smell. We started to talk about a more specific and difficult subject with him: The fragrances of Istanbul. We learned a lot about the magical world of the subject. Ozan started talking about periods in which his perception of fragrance was formed. "Like every kid, I did not like to stop playing in my childhood. I had to drink a glass of milk every day. Aunt Güzin, who used to come to our house to help my mother with household chores on some days of the week, would run after me and, if necessary, find me under the table where I was hiding and make me drink the milk. Combine the fragrance of her sweat, which comes from being a housekeeper all day in summer and then running after me, with a glass of warm milk. That is the first smell I remember. I still sense this smell when there is something that I do not want to do. Olfactory memory is so strong. If there is a reminder smell or event, you can go back to that moment," he said. For Ozan, cities have smells, but it is difficult to express a city with a single fragrance. "I think it is unfair to confine Istanbul to a single smell profile because this profile cannot be the same for the Levent and İkitelli districts. There are even serious differences between the present Karaköy and Karaköy 10 years ago. While you smell burgers and coffee now, you used to smell ironmongers and shops in the past. For me, Istanbul is still best described by the smell of simit and tea," he said. Ozan stressed that a person who visits a city for the first time can sense the smell of the city most. "Cities have smells, but residents cannot describe it because they are used to it. Smells are clearer for outsiders. Adaptation and harmony acclimate people to smells. Sensory stimuli lose their effect when you are exposed to them for a certain period of time. When you start working in a leather workshop, the first two weeks will be difficult. Then the smell becomes normal. The situation is the same for a sewage treatment worker. For someone coming from the U.S. to Turkey, the smell of a kebab made from mutton and lamb can be heavy. When you go to China, you will find the smell of the herbs and sauces they use different, as well. Smell affects the one who is unused to it the most. It is difficult to confine cities like Istanbul to a single fragrance. In different areas, different lifestyles produce their own fragrances," the perfumer added. Without smell, we could not describe a flavor in any way. We always use the word taste, but that is a restricted and incorrect expression. Eighty percent of what we call taste is smell. We might not even be able to describe what we eat without the smell of food. This way we only notice rotten and spoiled items. With taste and its pleasure, we take a lot of things from our lives. The second is about security. Natural gas and tube gases have no smell. Odors are added to them so that they can be noticed when there is a leak. Fragrances are one of the most important elements of our lives. They save lives. On the other hand, losing the sense of smell can lead to big psychological problems, depression and even suicides. The loss of the sense of smell cannot be experienced only in a congenital way but also by head traumas. Today, when you go around Salı Pazarı (Tuesday Bazaar) and Tophane, you will see that coffee shops are popular. You can smell a lot of coffee and fried foods from burger shops today whereas this was a place where many iron-processing workshops were located 20 years ago. It smelled of wrought iron. The Spice Bazaar is Istanbul's timeless center that gives the city its smell chart. Here, there is a smell of spice mixtures belonging to this area. Foreigners can remember the smell of the Spice Bazaar long after visiting Istanbul. The Spice Bazaar has a smell of the mixtures of spices sold here. In the Kadıköy Bazaar, you will receive an intense smell of kokoreç, cow or lamb intestines grilled with plenty of spices and served as a sandwich and mussels. In recent times, the smell of hookahs has been added. In my childhood, Kadiköy smelled of sea and fish. Most of the old leather factories moved to the Kurtköy neighborhood. Kurtköy leather smells, especially when the wind reverses. The smell of cities and neighborhoods also become different in line with social and cultural changes. The district of Sarıyer, famous for the fishermen of my childhood, smelled of fish. Now, this smell is slowly getting lost. The shores of the Bosporus, Kandilli, Beykoz, Bebek, Emirgan continue to smell of the sea. The smell of the sea gives a feeling of freshness and is like therapy. Beşiktaş still smells of linden and oleaster. Someone unused to this smell cannot predict this smell but feel a great peace with it. Üsküdar smells of processed food, fish and food. Settlements that were established later, such as Halkalı and Beylikdüzü, have no clear smell yet. They do not have much experience, as well. 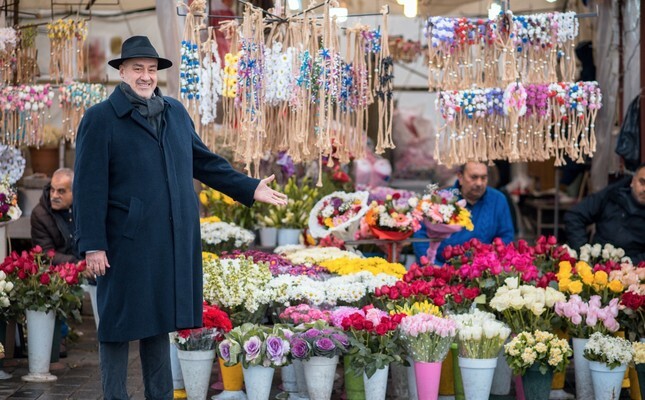 You can still experience the forgotten smells of Istanbul in Fatih district. It is one of the rare places where you encounter the smell of lemon cologne from an old hairdresser, sip tea and chat. Beyoğlu is a cosmopolitan neighborhood. There are also venues for tourists. For example, you can encounter agarwood perfume, which has been in demand among Arabic tourists in recent times. The smell of desserts from baklava shops is also one of the common fragrances in the neighborhood lately. During the Ottoman period, the palace had a very rich scent culture because we are on the road between the East and the West. Thus, elites that controlled the road benefited from it. For example, rosewater was offered in the palace. There was a team solely responsible for offering rosewater. That rose-water culture also turned into cologne after Sultan Abdülhamit. No other culture has a cologne culture like us. A lot of people in the West are born, live and die before they see a cologne bottle. Lemon cologne is like a national perfume for us.